Each year, we take our kids to Apple Hill. It is an awesome place near Placerville, CA with a ton of different farms. Each farm is a little different, with offerings of everything from apple and berry picking to pony rides and fresh fudge. You can visit their website HERE. If you don't live in the area, you can check out pickyourown.org and search for apple picking farms in your area. Whenever we do an activity like this with our children, I like to do a craft or activity to help them prepare for the trip. 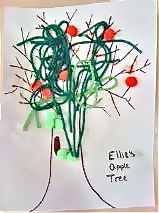 If you are planning a trip to pick apples, or if you are just wanting to do a fall apple craft, try this one out! My children will eat an apple every day, so long as it is peeled and in a "twirly" shape. 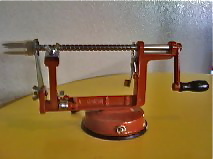 They also love to put the apple on the corer and spin the handle themselves. I have found that kids are much more apt to eat items that they have helped to prepare. Wondering what to do with the mess of apple-skin strings left over? Put them in a bowl for your kids to play with...wonderful sensory activity!